Are you planning a surf trip in Easter? Easter is approaching and is one of the dates marked in red in the calendar of any surfer to stick to a surfing getaway. Also it is very good time to surf in Cantabria, the good waves are (almost) assured. Come and enjoy surfing at Easter! Surf lessons at Easter for all levels and ages. Small groups and homogeneously separated. All material included! More than 300 tables and suits to rent. Surfboards, SUP, Skate, Bodyboard … Possibility of testing different boards. Are you going to take advantage of the holidays to travel in Easter? In the Escuela Cantabra de Surf we have an offer of Accommodation + Surf irresistible. Easter is one of our favorite surfing dates for all surf lovers. And you? Do you feel like surfing at Easter? We are waiting for you at the Escuela Cantabra de Surf . With the best teachers and the best courses, with a teaching method tested for more than 27 years to ensure quality teaching and learning. Easter is here and the forecast we have is quite good for the next few days. Are you going to miss it? 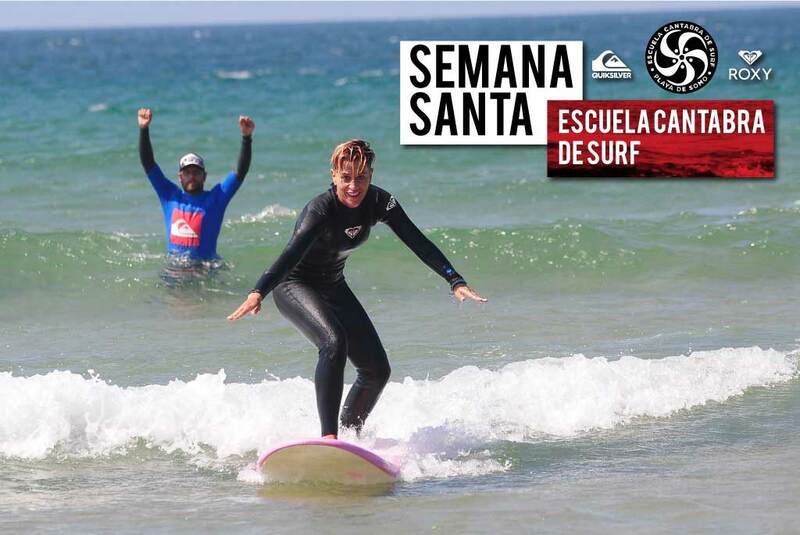 From the Escuela Cantabra de Surf we have prepared some SURF WEEKLY packages that you can not miss. ESCUELA CANTABRA DE SURF QUIKSILVER & ROXY reports that all its courses, Camps and activities for this season are now activated. As in recent years, the school is open every day, throughout the year … and although many of its monitors travel in winter to train and surf all over the world, others have remained in Somo, involved in the Courses and Winter Camps. We have prepared a Surf + Accommodation offer irresistible Surfing on Easter. If you are interested in surfing at Easter, ask about our offers, we will be happy to help / advise you. You can also sign up for surfing, skateboarding, SUP or bodyboarding.